Favored Class bonus:Increase total number of points in the arcanist’s arcane reservoir by 1. Phaera has almost white skin and white hair with light blue highlights. Her somewhat tangled hair somehow stays unnaturally beautiful. Her body is so pale and her skin is so perfect that she could be a porcelain doll. Her body is lithe and slender and her clothes barely cover it. She dresses in flowing, warm-weather clothing made of light-blue and white silks. She usually wears a shoulder bag containing her books and whatnot. She doesn't wear jewelry, but she wears a short capelet made of brownish yellow fabric that just covers her shoulders. She is stoic but personable. She clicks her tongue when she is thinking and doesn't like looking people in the eyes. She hasn't quite grasped the intricacies of the shorter-lifespan races. She doesn't mean to, but she somewhat thinks of them as children that must be guided and protected. 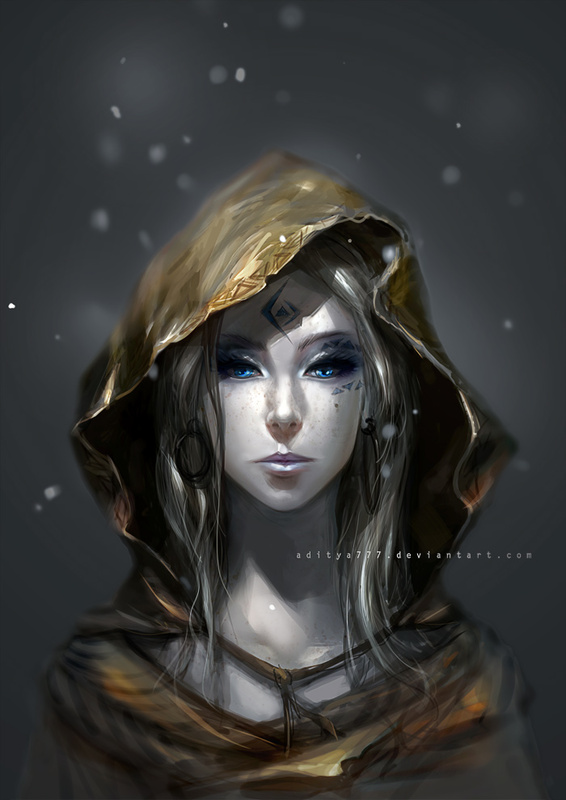 Phaera was born in the far north of Golarion, in the mountains of the Crown of the World. Her society was extremely xenophobic and secretive. They rarely contacted, let alone explored, lands that were not their ancestral homeland, but tales of the threats from beyond the Crown of the World made the elders concerned. Phaera was a bit too curious about the outside word. She had been studying magic under her master for going on forty five cycles and her wanderlust began to take hold. That mixed with the arranged marriage to an undesired lifemate, that her family had reluctantly allowed to be delayed due to Phaera's magical studies, had made her jump at the opportunity to take the path of a "Twilight Speaker". Twilight speakers are traveling envoys of Snowcaster tribes. Due to the Snowcasters' insular society, some twilight speakers are viewed as being corrupted by the outside world. This mantle of "corruption" was happily donned by Phaera as she basically exiled herself to a life of adventure, knowledge, and protecting her homeland from afar. The character has a mystic connection to one terrain type, Cold (ice, glaciers, snow, and tundra), selected from the ranger’s favored terrain list. The character selects three 0-level druid spells (Create Water, Enhanced Diplomacy, Guidance) and one 1st-level druid spell (Endure Elements). If the character has a Charisma score of 11 or higher, when in the selected terrain, she gains these spells as spell-like abilities that can be cast once per day. The caster level for these effects is equal to the user’s character level. The DC for the spell-like abilities is equal to 10 + the spell’s level + the user’s Charisma modifier. These spells are treated as being from a fey source for the purposes of the druid’s resist nature’s lure class feature and similar abilities. This trait replaces keen senses. Some elves obsess over the fundamentals of magic, training for decades to add layers of potent spellwork before they ever begin practicing true spells. This builds a foundation that makes their magic increasingly difficult to resist. These elves gain Spell Focus (Conjuration) as a bonus feat. This racial trait replaces elven magic and weapon familiarity. An occultist adds all planar ally spells to her spell list (using her arcanist level as the cleric level), and treats plane shift as a 5th-level arcanist spell. An occultist can spend 1 point from her arcane reservoir to cast summon monster I. She can cast this spell as a standard action and the summoned creatures remain for 1 minute per level (instead of 1 round per level). At 3rd level and every 2 levels thereafter, the power of this ability increases by one spell level, allowing her to summon more powerful creatures (to a maximum of summon monster IX at 17th level), at the cost of an additional point from her arcane spell reserve per spell level. An occultist cannot have more than one summon monster spell active in this way at one time. If this ability is used again, any existing summon monster immediately ends. This ability replaces the arcanist exploit gained at 1st level. The arcanist can prepare a spell in place of an existing spell by expending 1 point from her arcane reservoir. Using this ability is a full-round action that provokes an attack of opportunity. The arcanist must be able to reference her spellbook when using this ability. The spell prepared must be of the same level as the spell being replaced. At 1st level, you can teleport to a nearby space as a swift action as if using dimension door. This movement does not provoke an attack of opportunity. You must be able to see the space that you are moving into. You cannot take other creatures with you when you use this ability (except for familiars). You can move 5 feet for every two wizard levels you possess (minimum 5 feet). You can use this ability a number of times per day equal to 3 + your Intelligence modifier. Whenever you cast a conjuration (summoning) spell, increase the duration by a number of rounds equal to 1/2 your wizard level (minimum 1). This increase is not doubled by Extend Spell. At 1st level, a school savant chooses a school of magic. The arcanist gains the abilities granted by that school, as the arcane school class feature of the wizard, treating her arcanist level as her wizard level for these abilities. She can also further specialize by selecting a subschool. In addition, the arcanist can prepare one additional spell per day of each level she can cast, but this spell must be chosen from the selected school. Finally, the arcanist must select two additional schools of magic as her opposition schools. (Enchantment, Necromancy). Whenever she prepares spells from one of her opposition schools, the spell takes up two of her prepared spell slots. In addition, a school savant takes a –4 penalty on any skill checks when crafting a magic item that has a spell from one of her opposition schools as a prerequisite. A school savant cannot select the school understanding arcanist exploit. with cold resistance gained from any other source. +2 trait bonus on Survival checks, and Survival is a class skill for you. –2 penalty on Diplomacy and Sense Motive checks made against creatures of a different race or from a different culture. Last edited by Drakestendor; Feb 25 '19 at 5:55am. Just letting you know we start at level 4 my dude. do you want everything on the sheet? Keeping it updated provides many benefits. First of all, it makes it much easier to have the stats with the post by linking the sheet. This makes it much easier for me to check on what you have and don't have. Second, it won't get deleted or locked unless you do that yourself. Third, you can easily make copies to experiment with/keep a back up just in case. Fourth, it makes it much easier to level up and keep track of any bonuses you have from any sources. All in all, It's a really good tool, and I heavily suggest using it.